The past two weeks have been a whirlwind of activity on the research front for me! We just completed two weeks of teacher professional development at Penn State Brandywine, which has been amazingly rewarding but also amazingly exhausting! A welcome sign for the workshop participants! From July 21-26, we welcomed 15 teachers from central and southeastern Pennsylvania to a week-long workshop on solar system astronomy. One of the co-leaders of the workshop was Dr. Tim Lawlor, who many students have taken astronomy with on campus during the semester. I assisted with some basic logistics for this program – providing markers, rules, ordering pizza for lunch, etc. During the following week, July 28-August 2, I co-led the workshop on plate tectonics. Eighteen teachers joined myself and my co-leaders for activities on volcanoes, earthquakes, and mountain building to reinforce content knowledge and to present ideas for best pedagogical practices. The campus wrote up a really nice article celebrating these teachers coming to campus, and even our lighted sign along Route 352 welcomed our visitors! These teachers were so much fun to work with, and seeing their energy and excitement for learning and teaching just energizes me even more to find ways to provide them with the resources they need. Part of my grant work involves growing the new organization PAESTA – The Pennsylvania Earth Science Teachers Association. 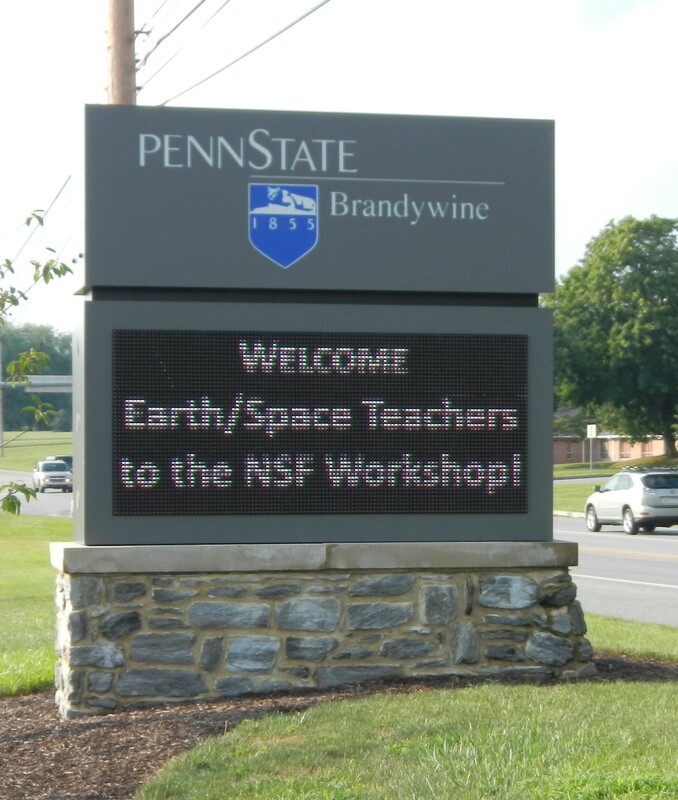 We will be hosting the second annual PAESTA conference at Penn State Brandywine this October for the second year in a row, and I look forward to bringing together a large group to celebrate Earth and space science teaching!